Wouldn’t it be so nice to be able to go back in time and give your former self a pep talk? Think about a difficult time in your life, how at the time the crisis brought stress and sadness and then, with time, you overcame and (hopefully) even learned from it. How encouraging it would have been to have a visit from your future self, telling you that everything was going to be alright. Well, I was blessed with that exact thing, during my first hypnotherapy session with therapist Diana Morrison. while picking medical berries in the jungle by an arrow to the heart by a mistaken hunter. The second life, I *may* have been Benjamin Franklin. I mean, I’m just saying. 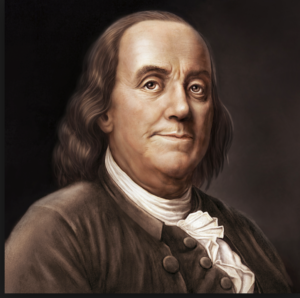 All I know is that I was a powerful and respected statesman who grew up on a farm and eventually found myself addressing fellow politicians and holding important papers in early colonial American. I was a womanizer, though; I had a vivid memory of a woman scorned slapping me on the steps of the library. I expired naturally at a very old age. So, I’m very open to hypnosis and I understand its power to tap into the subconscious. Of course, there is so much going on in our minds that we are barely conscious of. For years through my yogic practice, I have worked to mindfully confront, accept and control my emotions, which are usually seated in the subconscious and for many the ruler of their day-to-day lives. Part of this practice for me involves verbalizing when sadness bubbles up. I say aloud, “Oh, I feel some sadness that needs to be realized.” And then I cry. And then I let the sadness evaporate, and I go about my day. Many people I know feel sadness, try unsuccessfully to suppress it and then it lingers, sometimes pushing them into depression. life filled with drama? It’s possible to get off. Our habits and beliefs live in our subconscious as well. People whose knee bounces up and down quickly when seated at a table certainly aren’t consciously doing that habit. Smokers often light up before they even realize they’re doing it, and those who judge others by the color of their skin often deny they are racist because they’re not consciously doing it. You may think that your beliefs are supported by hard facts, but simply think about the weather: What’s hot to you might be cold to someone else. It’s what you believe to be. Just as I was able to get a grip on my emotions, it’s also possible to rewire your brain to change habits and beliefs. All of this, of course, is easier said than done. I did the work on getting in touch with my emotional state after months of time by myself and years of yoga. If you haven’t cried on your yoga mat, you’ve either figured out all your stuff – or it’s time to go deeper. Well, I was ready to go deeper when I discovered Diana Morrison. Based in Canggu, a beachy neighborhood in Bali where I’m headed, she has an online hypnotherapy and counseling practice that’s available to anyone in the globe. This time, I was ready to address my habits surrounding food. As faithful readers know, I’ve been following various fasting regimes for the last four years. I enjoy some aspects of fasting, primarily that it creates space in my life to focus on the many life projects that I juggle all the time. But fasting is not easy, and it greatly impacts my social life. Plus, it messed with my menstrual cycle, which I really don’t like. I was also finding that on my off-days, I was overindulging in treats. So then when I would schedule a day of fasting, there was a part of me that felt like not eating was a punishment for eating too much the other days. Even though I was basically maintaining my weight, I was having a hard time creating a healthy balance. I wanted to address it, and I was ready to change. 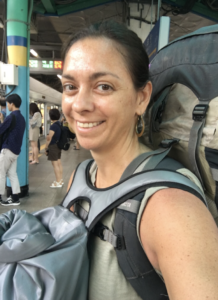 I filled her in about my relationship with food, which is healthy in some ways – I’m a vegetarian who eats lots of whole foods, drinks plenty of water and enjoys cooking meals from scratch – and very unhealthy in other ways. I have a sometimes-over-powering sweet tooth, sometimes drink too much, sometimes eat too much, sometimes snack even when I’m not hungry. Growing up half-Italian, there was always “more in the kitchen” and the overarching familial belief was that food was love. When I was really young, my parents used to joke that I was solar-powered because I ate so little. At some point, that changed. 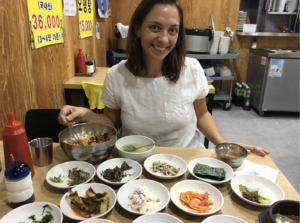 Diana, who specializes in all this, talked to me first about the revolving cycle of food restriction (in my case, fasting), inevitably eating “bad” things and feeling like crap … and repeat. Anyone who’s ever been on a diet knows this cycle: You’re doing really good, and then suddenly you “fall off the wagon” and are mad at yourself. Maybe you’ll feel the need to exercise really hard or double-down on your dieting, or you give up and feel even worse. You’re punishing yourself. You believe you failed. You’re a failure. So, how do you get off this roller coaster and still fit into your jeans? The answer – just like with emotions – is mindfulness. The next thing Diana did with me was a short mindfulness exercise to help me get back in touch with my body. If I really only ate when I was hungry, and if I really only ate exactly what my body needed, there would be no problem. My unhealthy eating practices were simply a result of not being mindful of my body. By repeatedly listening to the mindfulness exercise (she taped it and emailed me), I could rewire my brain to only want the amount and kind of food that my body needed. It just took some focused effort. Then the powerful stuff: hypnosis. With her techniques and training, Diana was able to deeply relax me. That’s when she introduced me to my future self. I saw me! I was so happy and free, even more than I am now! I ran up to me and gave me a big hug. It felt so wonderful! My future self told me that I absolutely had the power to change any habit or belief that I wanted, that I loved myself enough to let go of the concept that food was anything other than the important and targeted fuel my body needed. My future self told me to stop polluting my body. 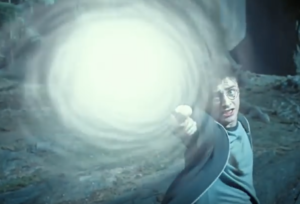 “Expecto Patronum!” – the best scene in the Harry Potter series, when he knows he can save his past self because he already saw himself do it. didn’t have a problem at all. What more confidence did I need? I know I can change because here I was, showing myself that I already had. I’m committed to change my beliefs and habits. I’ve decided, with Diana’s advice, to make my fast days about spiritual growth, rather than anything to do with weight. Fasting should not be a punishment, but it can be an opportunity to have a quiet, introspective day or two that helps me be my best self. In the last few days since the hypnotherapy, I’ve made mindful food choices and already feel better. In Bali, I’m even better positioned to fuel my body when I’m hungry with smoothie bowls and fresh fruit. I’m one step closer to my best self, and I’m impressed how just one hypnotherapy session made so much difference. It was a gift to hold my little hand, to lead myself toward a better me, one day at a time.